People using Facebook may soon start to receive advertising via Messenger, though only under limited circumstances, the company's VP of messaging products announced this week. If a person has previously communicated with a company via Messenger, that business can now pay to send sponsored messages, David Marcus said at Web Summit 2016 in Dublin, according to CNET. To further calm fears about spam, people will be able to block companies from further messaging, and Facebook may penalize a business if it gets enough complaints. Companies will, however, have a 24-hour window after a person has messaged them to send a message for free, which could encourage some to be quick about advertising. 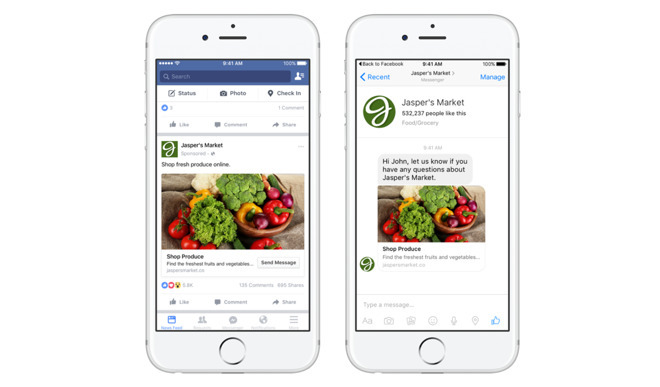 Facebook is also rolling out support for News Feed ads that let people jump straight into a Messenger conversation, which should increase exposure to the commercial uses of the platform. Earlier this year Facebook introduced chatbots to Messenger, capable of handling some basic customer service tasks and complete transactions. For Facebook, one advantage of bots is that they keep people in its app ecosystem, and hence exposed to its ads.